OK, so maybe there's a typo, or two, in there. But the cold is starting to affect the proper function of my brain. It was -5F this morning, balmy by Minnesota standards, but still frigid. Walking the Crabby canine had me waxing on the wonders of living in a cold climate. A light wind causing snowy ripples in the landscape. Crystalline flakes, caught in the sunlight, erupting into countless rainbows. It was a foggy, fairy tale world. That was until I realized that the fog was my eyes freezing, and the raspy rale wasn't the wind but my breathing. Took an hour to warm up. Bitter cold weather is a great time for fantasizing. A Caribbean beach? Desert sands? Swaying Hawaiian palms? How about an afternoon sun caressing Tuscan hills? Yeah, that's it. A glass of red, a little cheese, some bread, maybe a few olives, ahhhhhhhhh. Arrange chicken pieces in a 13x9x2 inch baking dish. Mince the garlic cloves, mixing in the teaspoon of salt. Rub the garlic mixture into the chicken. In a medium bowl, mix the lemon juice, olive oil, chopped rosemary and sugar. Combine well. Pour over the chicken. Add pepper to taste. Cover and chill 3 to 8 hours (basically for as long as you can). Remove the chicken from the refrigerator and uncover. Preheat oven to 350 degrees. 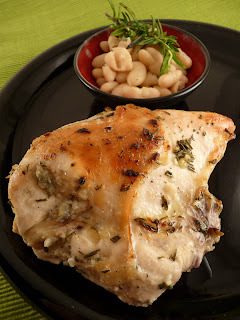 Bake chicken until cooked through but still juicy, basting occasionally, about 40 minutes. Remove chicken from oven and turn on broiler. Broil chicken until just browned, about 5 minutes. Serve. 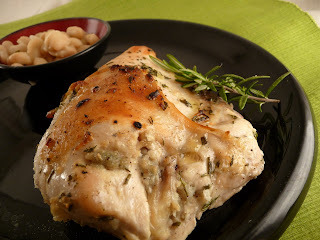 There you go, a simple and tasty chicken recipe. The key to this recipe is marinating the chicken pieces for as long as possible. I've done it overnight, though you risk having it get a little chewy if it's left in the lemon juice too long. OK crablings, I'm outta here, until next time, remember, you can do it, you can cook. Crabby Quiz: Name the source, author and speaker of the opening lines. Quote from Yogi Berra first visit to Candlestick Park. But seriously, Tuscans eat birds like Americans eat burgers. And the white beans are the classic Tuscan side dish. There is more to Tuscany than Super Tuscans, Chiantis and Brunellos.... but there is confusion. There is a town in Tuscany with the name Montepulciano and in this town they DONT grow the grape Montepulciano. They do grow a grape called Prugnolo Gentile, an offshot of the Sangiovese. Lovely winter red for a bird like this. Look for names on the label like Vino Nobile di Montepulciano, or the lighter Rosso di Montepulciano. Good producers are Poliziano, Avignonesi and Dei. Best years are 2006, 2004, and 2001. Avoid 2002! This looks great! It's pretty cold here too - not quite as cold as it is where you are, but cold enough to keep me indoors. This looks like a great way to mentally transport yourself someplace a little less unpleasant.